Turns out Johnny and Frost know a little something about pitchers and strikeout rates. 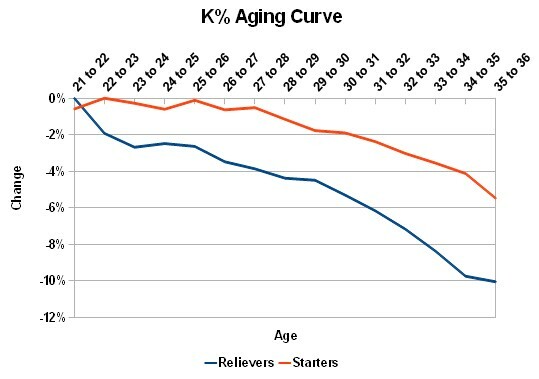 Thanks to the inestimable Jeff Zimmerman, we have strikeout aging curves for both starters and relievers. As dawn turns to day, it seems, pitchers also lose their gold. Here is a more detailed explanation of how Zimmerman did his hitter aging curves. He repeated a similar process for this graph, and the sample goes back to 2002. What a stark graph. Zero is the peak, so your average pitcher’s strikeout rate pretty much peaks when he debuts, or shortly afterward. Starters might be able to maintain that peak until 25 years old, or so, but they never really improve the rate. Relievers? Let’s just say you better smoke ’em while you got ’em (and then let ’em walk). That’s probably the biggest take-away from this graph: If a pitcher’s strikeout rate naturally declines from day one, you probably don’t want to build your team on free-agent pitchers. Despite the high attrition rates for pitching prospects, it seems to make sense that you’d develop your own pitching, rather than aquire — by definition — post-peak free-agents. This also might put a little tiny check mark in Yu Darvish’s corner, considering the fact that he’s 25 — but that’s a story for another time. This graph is yet another reason to avoid signing free-agent relievers to multi-year deals. You’re not going to like the third year of that Brandon Lyon deal, Houston. And we told you so. It’s not like he was falling off a nice peak. Remember this effect when evaluating similar young pitchers, too. Do you like Brandon Beachy and Vance Worley? They pitched a similar number of innings last year, are a year apart and had decent control. Neither was a top prospect, so both were pleasant finds for their teams and are under team control for a good chunk of time. But the Braves should be less willing to trade their young starter. Beachy is coming off a 28.6% strikeout rate, which might represent his peak. Worley, on the other hand, debuted with a 21.5% rate. Even if Worley has a marginally better ground-ball rate, his strikeout rate is statistically likely to get worse — and it’s coming off a lower peak. But, of course, there’s true talent and then there are results. Someone like Mike Minor, in particular, could see a true-talent decline and still have better results in the future. No one is is suggesting that every pitcher in the league last year will show worse overall results going forward. The bouncing ball knows no master. Still, when it comes to those fascist strikeouts, we know that you’ll probably never be as good as you just were. We hoped you liked reading Aging Strikeouts: You’ll Never Be This Good Again by Eno Sarris! Okay, but there’s no breakout for different types of pitchers. I imagine different styles age differently. I always thought that when Ralph says “stay gold, Ponyboy” that he was talking about his heart. Like, he should “stay gold” in his heart. But I realized the other day that he’s not. He’s talking about his hair. If you go back and watch the movie again you’ll see that Ponyboy has gold hair in that scene. He dyed it to get away from the cops. And ralph was like, thats cool hair. uh, I assume that’s a joke, it’s clear what’s meant in the book, though the movie is kind of a mess…. When Ponyboy grew up, did he become Horseman?